In lieu of flowers, donations may be made to High Hopes Cancer Fund and left at the funeral home. Edward C. Heitz, age 85, of El Dorado Springs, Missouri, passed away at his home on Wednesday, July 3, 2013. Ed was born on December 29, 1927, in Moundville, Missouri, to Ted and Winnie Heitz. He was the oldest of eight children and was raised in the Sheldon and Bronaugh areas. Ed was baptized at the Christian Church of Fort Scott, Kansas, in 1939. Before the start of World War II, Ed’s family moved to Monterey, California, where his dad and grandfather worked at the Pebble Beach Golf Course, maintaining, watering, and mowing the greens. Ed worked as a caddy and would sometimes earn up to five dollars in a day. Five dollars was very good money in a time when a dollar was hard to come by. In early 1946, Ed was drafted by the U.S. Army. 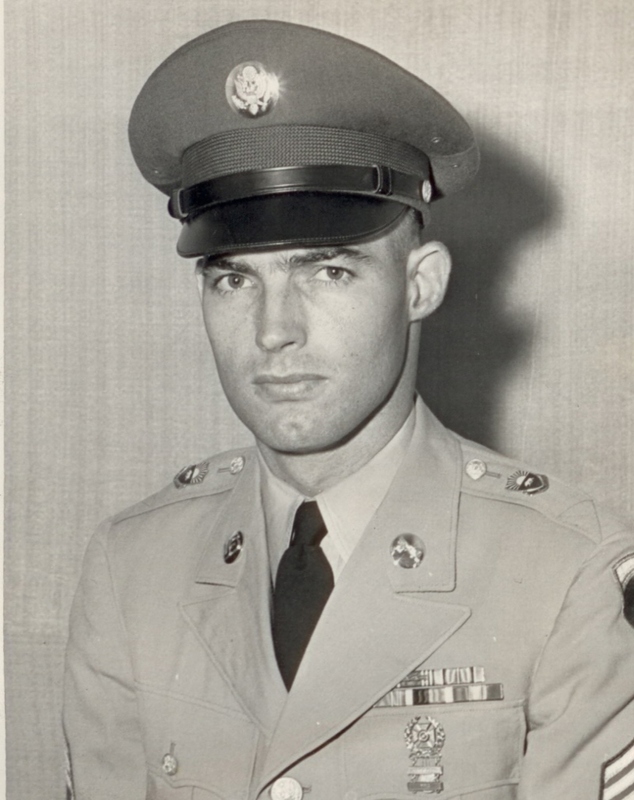 After basic training at Fort Riley, Kansas, he was shipped out to Germany where he served in the 793rd Military Police detachment. Ed and his family moved a lot during his twenty years of service. They lived in Germany, Italy, Fort Knox, Kentucky, Indianapolis, Pennsylvania, and West Virginia. They flew back and forth across the Atlantic Ocean several times and sailed by ship at least ten times. In September, 1963, while stationed in Italy, Ed and three other M.P.’s in his unit were handpicked by the Supreme Commander of NATO forces in Europe to personally protect the President of the United States, John F. Kennedy, during his trip to Rome, Italy. Ed also worked on the protocol for the launch of the missile defense system that was used to cover Europe and the United States. After discharge from the service Ed worked at local grain elevators, doing various jobs, for the next twenty-four years. He finally retired again in 1992. Ed was an avid golfer, loved baseball, researching his family history, model railroading, stamp collecting, fishing, gardening, and was, without a doubt, the biggest St. Louis Cardinals fan there ever was. He helped with the local Eagle’s teams. His grandson, Cliff, was on the team for several years, which brought Ed great pride and enjoyment. He was Eagle of the Year in 1998-1999. He took great pride in every endeavor he took on, and he loved history and his family. Ed was a great teacher with lots of patience. He recorded two holes-in-one on Number Seven at the El Dorado course. His grandson, Cliff, also recorded a hole-in-one there. That made Ed very proud, because he taught Cliff how to golf. Cliff was a great student because he loved the game like Ed did. Ed was a man who grew up in hard times and worked very hard for everything he got. He cared for his family and friends and wanted to help everyone be their best. In 2009, Ed had a quadruple heart bypass and lost his right foot below the knee, but this did nothing to stop his love of traveling and spending time with his family. Ed was preceded in death by his parents; his wife, Gertrude; one daughter, Mary; two brothers: Charley and Lester; and one sister, Bernice. He is survived by his son, Dale Heitz, and wife Terri; daughter, Carol Stephens; son-in-law, Leonard Ronlund, six grandchildren: Scott Ronlund, Brian Ronlund, Jacob Stephens, Jordan Stephens and wife, Crystal, Cliff Heitz and wife, Michelle, and Ashley Rogers and husband, David; seven great-grandchildren: Jordan Clay Stephens, Anthony Stephens, Greyson Stephens, Jaxson Stephens, Breana Ronlund, Parker Heitz, and Colt Rogers; two brothers: Bob and wife, Margie, of Joplin, Missouri, and Paul and wife, Margie, of Louisiana; and two sisters: Marilyn Malcolm and husband, Charlie, of Texas, and Janice Preston, of El Dorado Springs. Funeral services for Edward C. Heitz were held Monday, July 8, 2013, at 10:00 P.M. at Bland-Hackleman Funeral Home in El Dorado Springs with Rev. Brent Bland officiating. Burial followed at Worsley Cemetery near Bronaugh, Missouri under the direction of Bland-Hackleman Funeral Home. Pallbearers were Cliff Heitz, Scott Ronlund, Jacob Stephens, Jordan Stephens, David Rogers, and Randy Bobbett. Honorary pallbearers were Brian Ronlund, Ashley (Heitz) Rogers, Jordan Clay Stephens, Anthony Stephens, Greyson Stephens, Jaxson Stephens, Breana Ronlund, Parker Heitz, and Colt Rogers.